On the universal quest for personal independence and for fulfillment of growing-up dreams, a small-town Minnesota boy turns to raising runt piglets as a way to earn spending money of his own. Then a series of mysterious and unexpected postcards from a school called Phillips Exeter Academy begins to arrive, flooding his plans with uncertainty and confusing his inexperienced parents as to what is best for their son. 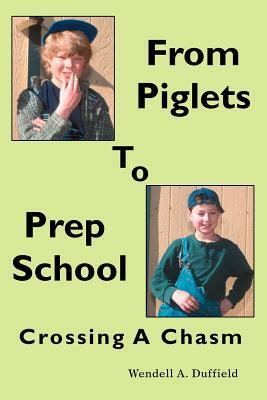 "From Piglets To Prep School: Crossing A Chasm" describes the unanticipated and fundamentally unwanted struggle that this young boy faces as the postcards, eventually inviting him to attend the school on scholarship, continue to interrupt a comfortably familiar existence in his home town . a life of growing up in a virtual clone of Garrison Keillor's Lake Wobegon of Prairie Home Companion. Though satisfied at home, an inner voice seduces him to abandon his youthful dreams and join the cadre of elite preppies in New England. Overnight, names of his schoolmates change from Gary Gardner and Duane Labs to David Rockefeller and Peter Benchley. The social, economic, cultural, and academic shocks of such change are immediate and stunning . yet mostly manageable. This entertainingly illustrated book is a poignant and humorous memoir that will resonate with anyone who remembers his or her growing-up years. Share the fun, sadness, discoveries, disappointments, and pranks of a young hayseed kid uprooted from bucolic rural life and transplanted into the rocky New England garden of stuffy and highly competitive preppies. You'll be challenged to read the book without alternately laughing and crying as memories of your own early years are rekindled.